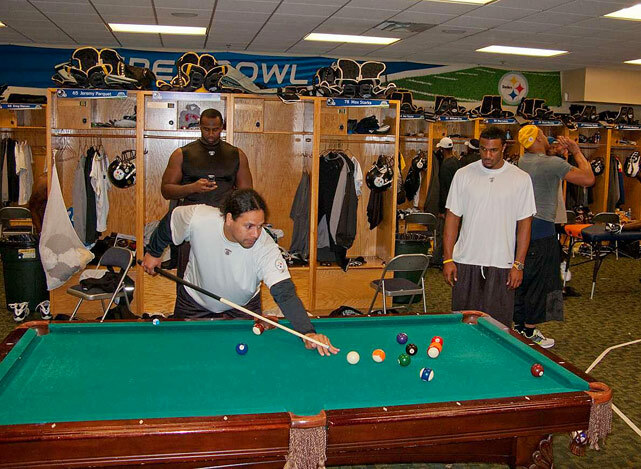 Steelers Vets Tell Youngsters: No Ping Pong For You! and I didn’t speak out because I didn’t play pool. and I didn’t speak out because I wasn’t seventy years old. and I didn’t speak out because I didn’t play ping-pong. and there were no games left to play. After falling to 0-2 last week, the veterans in the Pittsburgh Steelers locker room decided to hold a private closed-door meeting. Following that meeting, they addressed the youngsters about what it means to wear the Black and Gold. No word whether Ben Roethlisberger‘s ingenious plan to play show-and-tell with the team’s Lombardi Trophies was put into effect. What did go into effect was a ban. A ban on fun. Yes, the vets surveyed the wreckage of a quickly evaporating season and decided what was needed to whip these youngsters into shape was to take away their toys. Effective immediately, any player with less than 4 years of experience was prohibited from playing pool, shuffleboard, or ping-pong. Because when you take away a man’s ping-pong paddle, YOU MEAN BUSINESS. There has been much talk of a growing divide within the Steelers locker room. Over the off-season there were rumblings – most notably from Ryan Clark – about veterans being unhappy with the attitude shown by many of the team’s younger players. Clark’s comments concerning the absence of an Alan Faneca or Joey Porter and the team’s current leaders (Ben, Keisel, Shoeless Ike, Heath) all being members of the original ’05 championship team has led people to frame the divide being between Bill Cowher Guys and Mike Tomlin Guys. The choice of a four year cutoff is interesting because it would suggest there is something to the idea the ’08ers – who, like the ’05ers, were mostly Cowher guys – see themselves apart from the rest of team. No word on what they plan on taking away now that the team has dropped to 0-3. Radio privileges? Free Head N’ Shoulders products? Their mid-afternoon snack?